Tournament of Destruction Round 3: Five-0 @ The Dirty “O”! By admin Comments Off on Tournament of Destruction Round 3: Five-0 @ The Dirty “O”! Turning point, and maybe the breaking point, of the Team Demolition Derby season. Sustaining and building momentum is key to withstand the Summer-long marathon of mayhem to claim victory in the Tournament of Destruction. 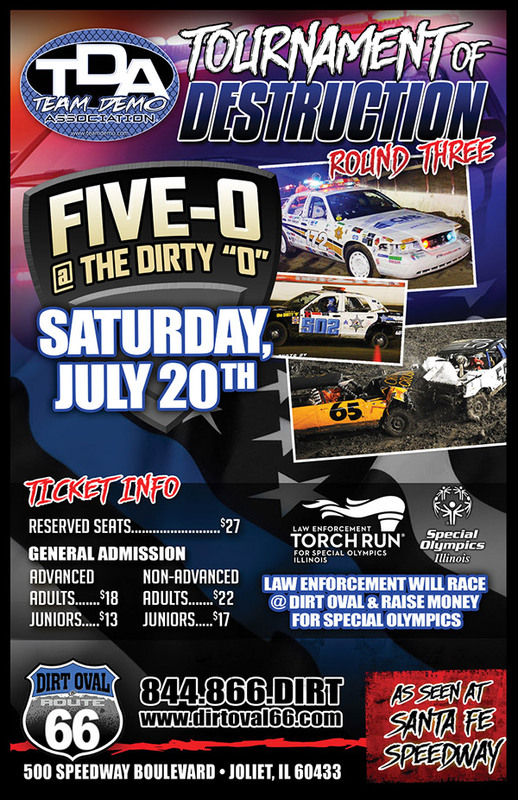 The 3rd annual Five-0 @ the Dirty O event is a joint effort between The Illinois Law Enforcement Torch Run and Dirt Oval 66 to support the athletes of Special Olympics Illinois. Five-0 Police Car Race – Law enforcement officers in a high speed pursuit to determine who is the Top Cop in Chicagoland. 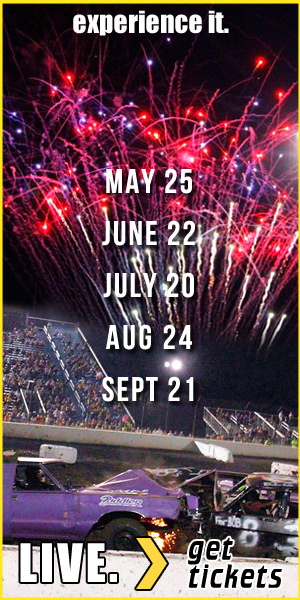 Over 20 cars will be in the field, racing 15 laps on the 3/8 mile dirt oval. It is unpredictable excitement! Each driver in the the Five-0 police car race must raise a minimum of $500 in order to participate. The greater the donation, the better their starting position for the race. Donate now to any of the registered drivers and help them reach a goal of $200,000. Five-0 Safety Vehicle Show – Law enforcement and emergency services vehicles on display near the main entrance. Watermelon eating contest – Truly feed your appetite for destruction! Both kids and adults are welcome to compete. Registration occurs day-of in front of the grandstands between 6-7pm. Watch video highlights from the 2017 Five-0 @ the Dirty “O” police car race! In-car cameras, sky-high drone view and from track side to get you ready for what to expect on July 20th!